I work for MetroPlan Orlando, Central Florida’s regional transportation planning agency. Each morning when I get to my desk, I log in to a statewide database of traffic crashes and review the latest pedestrian and bicyclist crashes uploaded for our area. This system allows me to review detailed police reports and classify the crashes based on the behaviors of pedestrians, cyclists and motorists. 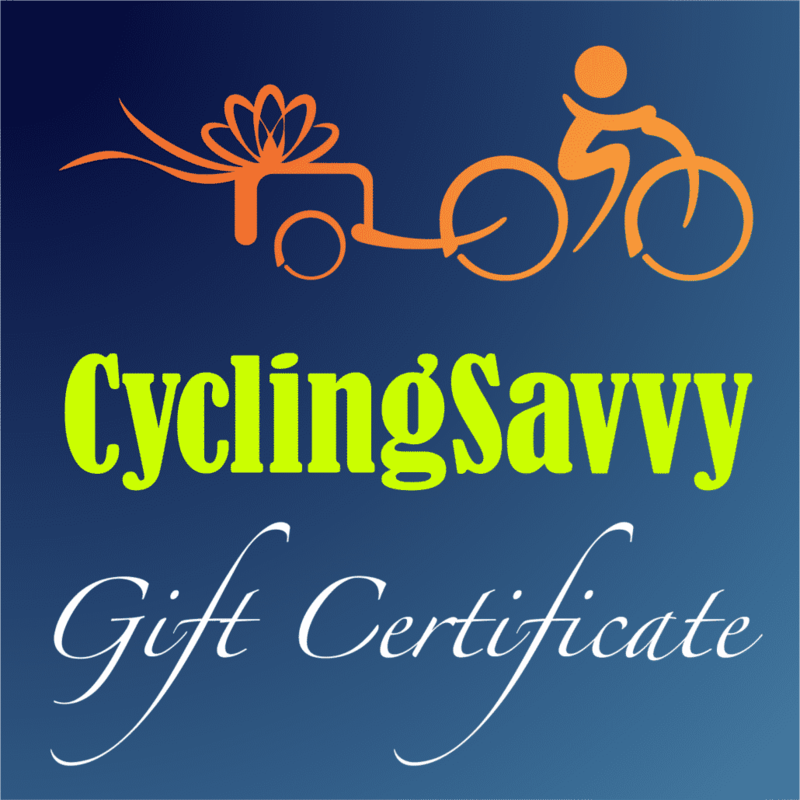 If you’ve taken CyclingSavvy you’ve seen some of the results of this ongoing analysis. 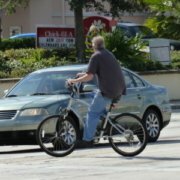 Crashes with motorists involving sidewalk cyclists are increasing both in number and as a percentage of the total. When I first did such analysis in the mid 1990s, less than half of crashes involved sidewalk cyclists; today it’s at 70 percent. Much of this increase is likely due to more of our major roads having sidewalks today than they did 20 years ago, and most now have curb ramps for wheelchair users, making sidewalks more accessible to cyclists. 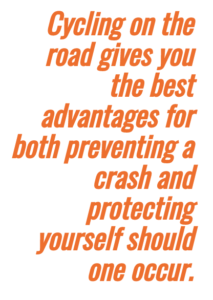 Those who have taken CyclingSavvy or read other knowledgeable sources on cycling safety understand the many ways sidewalk cycling increases crash risk. Sidewalk cyclists have more conflicting movements, poorer sight lines, and reduced predictability. 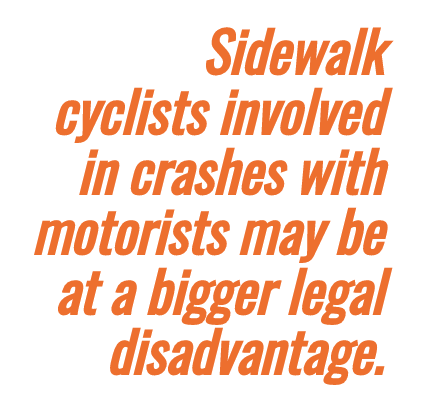 But in addition to the increased crash risk, sidewalk cyclists involved in crashes with motorists may be at a bigger legal disadvantage. In all states, a bicyclist on a roadway has all the rights and duties of the driver of a vehicle. In most states, bicyclists operating on sidewalks and crosswalks have the same rights and duties as pedestrians. Of course, sidewalk cyclists are not actual pedestrians. Cyclists can easily ride much faster than pedestrians walk. This applies at crosswalks as well as at driveways and mid-block locations. This language provides for quite a bit of wiggle room in the mind of a law enforcement officer. 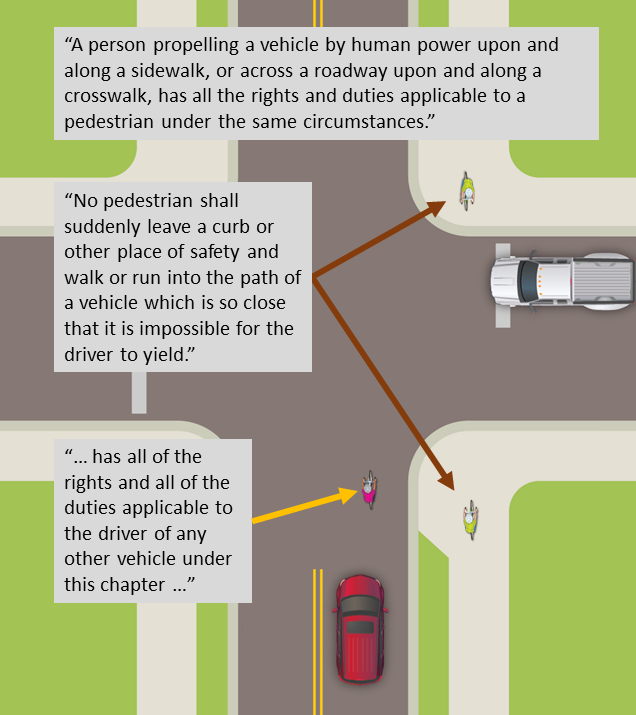 Compare the law for bicycle drivers to the law for bicyclists as pedestrians. I see many reports in which the officer stated that the cyclist committed such a violation, even though the cyclist was entering a crosswalk or crossing a driveway (driveway traffic is supposed to yield to pedestrians and other approaching traffic). No doubt in some cases the officer was correct in his or her assessment, but in many I see little evidence for that conclusion. It’s often the cyclist’s word against the motorist’s, with no independent witness involved. Because I didn’t see the actual crash, I can’t say for certain if the cyclist was violating that statute or not, but then, in most cases, the officer didn’t see it either. Reports rarely indicate whether the cyclist received a citation in such situations, but officers will mark the violation in a “contributing action” field. Imagine you’re involved in a crash. You want to file a claim for damages against the insurance company of the motorist. If the crash report says you violated the law, you’re going to have a very tough time making your case. Another disadvantage for sidewalk cyclists is at signalized intersections. At many signals the pedestrian walk phase — the only period during which a pedestrian or sidewalk cyclist may lawfully enter the crosswalk — is less than 10 seconds, and then shifts to a flashing “Don’t Walk.” The green traffic signal for the adjacent lanes is much longer, and the roadway cyclist can enter the intersection during that entire green phase. Sidepaths have all of the same disadvantages, plus most paths include stop signs for path users at locations that wouldn’t have them if it was just a regular sidewalk. Cyclists using the adjacent roadway are not subject to those extra stop signs. Let’s compare two similar crashes. Cyclist Jane is traveling in a regular travel lane with the flow of traffic. She’s riding along the right edge of the lane approaching an intersection with no stop sign for that direction. 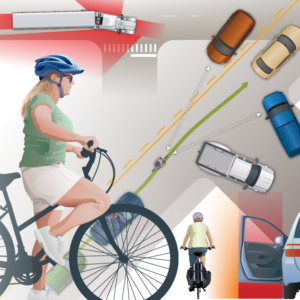 (Edge riding is entirely legal, but we explain its risks in CyclingSavvy.) A motorist comes up from behind and makes a right turn across her path. The two collide in a classic “right hook” crash. The next day Cyclist Jack is riding on the sidewalk going with the flow of traffic approaching the same intersection. Another motorist makes the same maneuver, also causing a crash. In the first case, the officer would be guided by statutes to find the motorist violated the cyclist’s right-of-way. In the second case, the officer knows that the motorist must yield to pedestrians legally in the crosswalk. But since cyclists can go much faster than pedestrians, it’s likely Cyclist Jack was not yet in the crosswalk when the motorist initiated his turn. Knowing that in this scenario the cyclist has the rights and duties of a pedestrian, the officer might conclude that Cyclist Jack should not have left a place of safety and moved into the path of a driver who couldn’t yield. My point here is not to criticize law enforcement, but to show how statutes work against the legal interests of bicyclists on sidewalks and sidepaths. But too often the law won’t protect you in court, either. 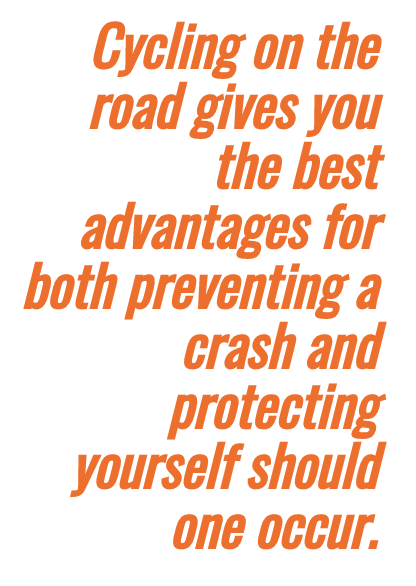 Cycling on the road gives you the best advantages for both preventing a crash and protecting yourself should one occur.